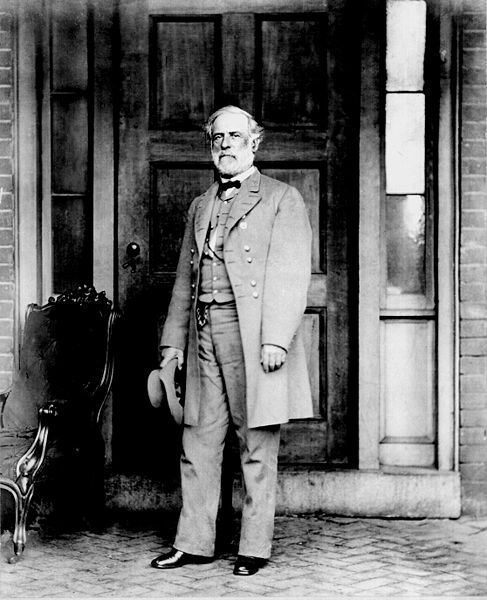 General Robert E. Lee (January 19, 1807–October 12, 1870) had rejected the offer to command Union forces on the grounds that he could not draw his sword against his beloved home state of Virginia. Lee stated that his "loyalty to Virginia ought to take precedence over that which is due the Federal Government." He further said that he had no greater duty than to his native state of Virginia. Lee was a 4th generation Virginian, son of Henry "Light Horse Harry" Lee (one of George Washington's favorite lieutenants), and Lee's wife, Mary Anne Custis, was the great granddaughter of Martha Washington. Robert Edward Lee was born on January 19, 1807, at "Stratford" in Westmoreland County, Virginia, to Henry and Anne Hill Lee. Robert's father, Henry Lee, was a distinguished cavalry officer who participated in the American Revolution where he gained the nickname "Light Horse Harry". Due to declining political prospects and financial problems, the elder Lee moved his family from Stratford to a home in Alexandria, Virginia (adjacent the Potomac River and across from Washington). Robert E. Lee attended school in Alexandria and enjoyed outdoor activities along the river. In 1825, the young Lee secured an appointment with the United States Military Academy at West Point. While at the Academy, he excelled in academics and military exercises. Appointed adjutant of the cadet corps, he graduated in the number two position of his class in 1829. Lee, to this day, is the only West Point cadet to graduate without receiving a single demerit. (Right) One of most famous photos of the Confederate officer was taken during the final month of the Civil War in 1865. As a young second lieutenant, Lee served at many army outposts and forts. Lieutenant Lee married Mary Ann Randolph Custis (a direct descendant of Martha Washington) on June 30, 1831, and the couple had seven children. 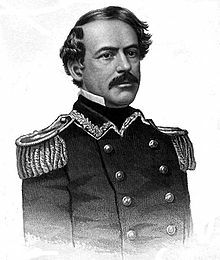 As an engineer, Lee supervised numerous projects in the Midwest and around Washington, and, with the outbreak of hostilities with Mexico, he served in the army and fought in many battles under General John E. Wool and General Winfield Scott. The young Lee distinguished himself during the Mexican-American War and was slightly wounded at the Battle of Chapultepec; consequently, the Virginian received several promotions after the war. In the 1850s, he briefly served as the superintendent of West Point and then transferred to a command in the 2nd U.S. Cavalry. In 1859, Lee took part in a dramatic event that contributed to the growing division between North and South. He was in Washington when the radical abolitionist John Brown and a small band of followers raided the United States Arsenal at Harper's Ferry, Virginia. Brown and his gang seized weapons and hostages with the objective to spark an uprising among the slaves in Virginia. Robert Lee and his troops were immediately dispatched to Harper's Ferry, where they eventually cornered Brown in the arsenal engine house, engaged in a bloody shoot out, and then captured Brown. Within a year, the talk of secession had become stronger throughout the South. As an army officer, Lee was against secession and never entertained the idea of a revolt against the United States government. Lee's allegiance, however, was with Virginia. 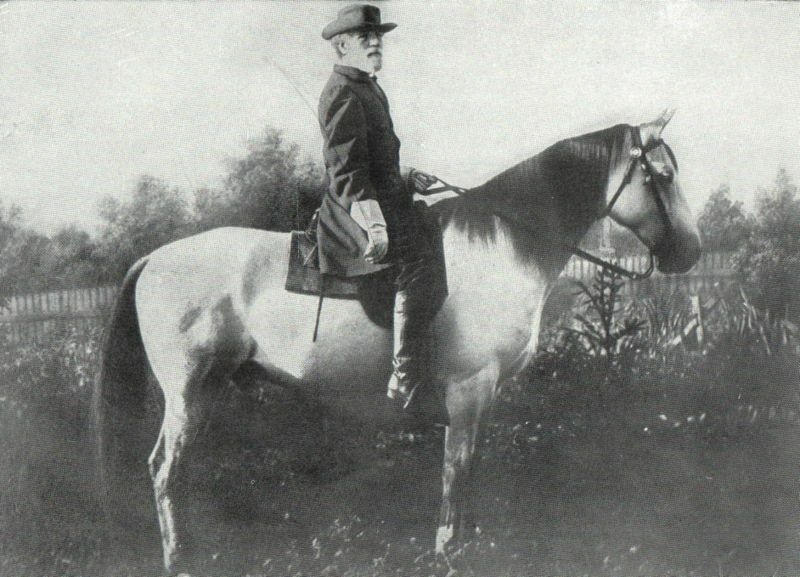 General Robert E. Lee mounted on "Traveller"
(Left) Robert E. Lee as a U.S. Army Colonel before the Civil War. (Right) One of the last known photographs of General Robert E. Lee, post-Civil War. Lee continued his work in Washington, living at his wife's ancestral home at Arlington. In 1861, the South did secede and Virginia soon followed. Lee was offered a command in the Union Army but declined to accept the assignment because of his oath, loyalty, and ancestry to Virginia. It was a difficult decision for Lee, but his "allegiance was to Virginia" and his strong family roots to Virginia. With some regrets, Lee resigned his commission and moved his family to Richmond; never to see the home at Arlington again. Lee offered his services to the state of Virginia and was placed in command of all military forces from that state. He was later assigned as "personal military advisor to President Jefferson Davis," which was a very difficult job. Lee had to coordinate numerous operations involving officers who were very sensitive about their command positions and obligations. It was a difficult time, and Lee suffered the brunt of heavy criticism. In the spring of 1862, the Union Army of the Potomac, commanded by General George McClellan, was poised to strike the city of Richmond. In a pitched battle at Seven Pines, General Joseph Johnston, commanding the Confederate forces, was seriously wounded. 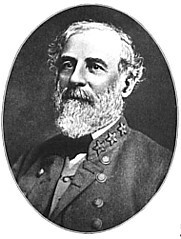 Lee was immediately assigned to replace Johnston and he took command of the army, which he renamed the Army of Northern Virginia. Despite some early difficulties, General Lee undertook the new assignment with vigor and spirit. Directing his troops near Richmond with those of General "Stonewall" Jackson in the Shenandoah Valley, Lee met the Union threat on two fronts. After quickly smashing the Union forces in the Valley, General Jackson rushed his troops to Richmond and joined General James Longstreet's Corps in attacking McClellan's army. Together, Lee and his officers were able to rout the Union threat during the Seven Days Battles. 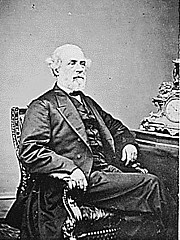 Confederate General-in-Chief Robert E. Lee in 1865. (About) Gen. Robert E. Lee in 1865. To record or take a single photo was a lengthy process in 1865, but unlike other photos of the Confederate commander, Lee, in this photo taken in the final months of the war, made no eye contact with or even in the direction of the photographer. While Lee usually positioned his hands in a "clinch or fisted" position, to look away or opposite the camera was rare in this 1865 photo. What followed was a set of victories against seemingly insurmountable odds. General Lee's army was always outnumbered, out gunned, and often in a poor position to attack or defend. General Lee, however, was a practical strategist with an engineer's sense, who was willing to take risks to outmaneuver his opponents. The support of excellent commanders contributed to repeated victories against the Union Army. Lee suffered several setbacks during the Maryland Campaign in 1862, which resulted in the Battle of Antietam. Still, General Lee's thin line held most of the battlefield at the end of America's bloodiest single-day of fighting, giving him a strategic victory. (Photograph to the right: Mathew Brady portrait of Lee in 1865.) Subsequently, he was forced to retreat across the Potomac River and back to Virginia. After the Battle of Fredericksburg in December, Lee spent the winter rebuilding his battered army. The Union Army also rebuilt itself and opened the spring of 1863 with a surprise move against Lee's forces. The Battle of Chancellorsville, Virginia, (one of Lee's greatest victories) was at a very high cost when "Stonewall" Jackson, his most trusted officer, was mortally wounded. Despite the loss of his beloved corps commander, Lee continued and invaded the North again. His troops successfully marched through Maryland and southern Pennsylvania until they clashed with Union forces at Gettysburg. The Battle of Gettysburg was a costly defeat for the Army of Northern Virginia; Lee felt a great and personal responsibility for the loss. 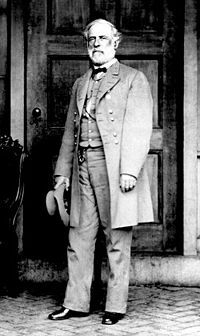 Lee even offered his resignation, but the Confederate government displayed great confidence in the commander and refused his resignation. 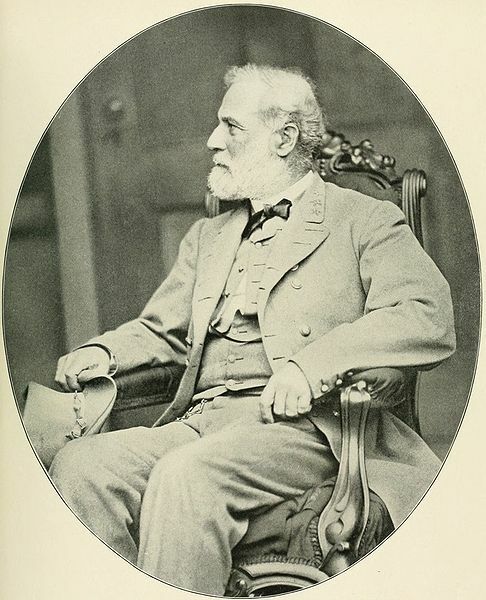 Robert E. Lee, Commander, Army of Northern Virginia, 1862–1865; General-in-Chief of the Confederate States Army, January 31, 1865 – April 9, 1865. General Lee faced a new antagonist in the spring of 1864. After a succession of Union victories in Tennessee and Mississippi, General Ulysses S. Grant arrived in Washington where President Lincoln placed him in overall command of Union land forces. Knowing that Lee must be defeated to end the Civil War, Grant chose to make his headquarters with the Army of the Potomac in Virginia. The Grant and Lee strategic duel began in the spring of 1864 in the "Overland Campaign," also known as the "Wilderness Campaign." Starting with the Battle of the Wilderness, May 5-7, 1864, the two armies grappled continuously for many weeks through middle Virginia and the fighting was bitter and brutal. Lee was able to block every maneuver Grant made and though Lee's forces inflicted heavy losses on the Union army, Grant continued his pursuit. Lee's losses could not be easily replaced and material shortages became more acute. Despite Lee's best efforts, Grant had succeeded in continually marching Meade's Union army southward, right to the outskirts of Richmond, where Lee also had to contend with the Union Army of the James. 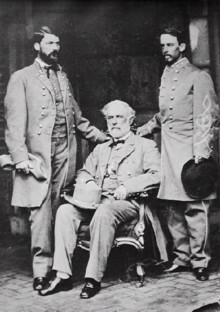 (Left) Photograph of General Robert E. Lee with son Custis, left, and aide Walter H. Taylor, right. Photographed at Lee's Richmond, Virginia, residence by Brady on April 16, 1865. Library of Congress. Lee knew that his army could not last through a long siege but he tenaciously resisted the relentless pressure of two Union armies. In March 1865, Lee ordered one last desperate gamble to break the Union siege of the city, an attack on the center of the Union siege line. Though initially successful, the attack was repulsed by overwhelming Union firepower and Grant renewed his efforts to take Petersburg by force. The Battle of Five Forks gave the Union control of the last southern railroad into Petersburg, and the Richmond-Petersburg line was doomed. With time and odds against him, Lee ordered his army to abandon both cities. He moved his dwindling army west hoping to eventually move south to connect with Confederate forces under General Joseph Johnston in North Carolina. (Right) Photograph of Lee in 1869 while president of Washington University. Disaster followed Lee with every step of the march. Despite his best efforts, Lee knew that the end was at hand when his remaining forces were blocked near Appomattox Court House, Virginia. On April 9, 1865, dressed in his finest Confederate gray uniform, General Lee met with General Grant that afternoon to sign the terms of surrender. Lee left Appomattox and his army forever and returned to Richmond. It was a bleak time for the general. Branded a traitor by many who wished to see him imprisoned and hanged, Lee quietly remained at his home in Richmond caring for his ailing wife. Yet there were many that highly esteemed Lee and responded with generous offers of financial assistance and employment. General Robert E. Lee: "Oath of amnesty"
In the autumn of 1865, Lee accepted a position as president of Washington College (presently Washington and Lee University) in Lexington, Virginia. With the assistance of an enthusiastic faculty, Lee revived the school and witnessed high standards in education. He also set an example for the South, working to rebind the wounds of a divided nation by obedience to civil authority. He quietly encouraged his veterans to return to their homes and rebuild their lives as Americans. The aged Lee never discussed the war nor wrote about his war-time experiences. He was given many offers of money for his memoirs, which an adoring public wished to read, but turned everyone down. Lee was sincere in his feelings in not discussing the war or the results of it, letting the record of his army speak for itself. On October 12, 1870, General Lee died after a short illness and is buried in the chapel of the university that bears his name. General Robert Edward Lee will forever be known as the "Beloved General." General Robert E. Lee statue, Lexington, Virginia. (About) "Recumbent Statue" of Robert E. Lee in “Lee Chapel” in Lexington, Virginia, with Lee asleep on the battlefield, sculpted by Edward Valentine. It is often mistakenly thought to be a tomb or sarcophagus, but Lee is actually buried elsewhere in the chapel. Benjamin Harvey Hill of Georgia, referring to Robert Edward Lee during an address before the Southern Historical Society in Atlanta, Georgia, on February 18, 1874, stated: "[Lee] was a foe without hate; a friend without treachery; a soldier without cruelty; a victor without oppression, and a victim without murmuring. He was a public officer without vices; a private citizen without wrong; a neighbor without reproach; a Christian without hypocrisy, and a man without guile. He was a Caesar, without his ambition; Frederick, without his tyranny; Napoleon, without his selfishness, and Washington, without his reward." 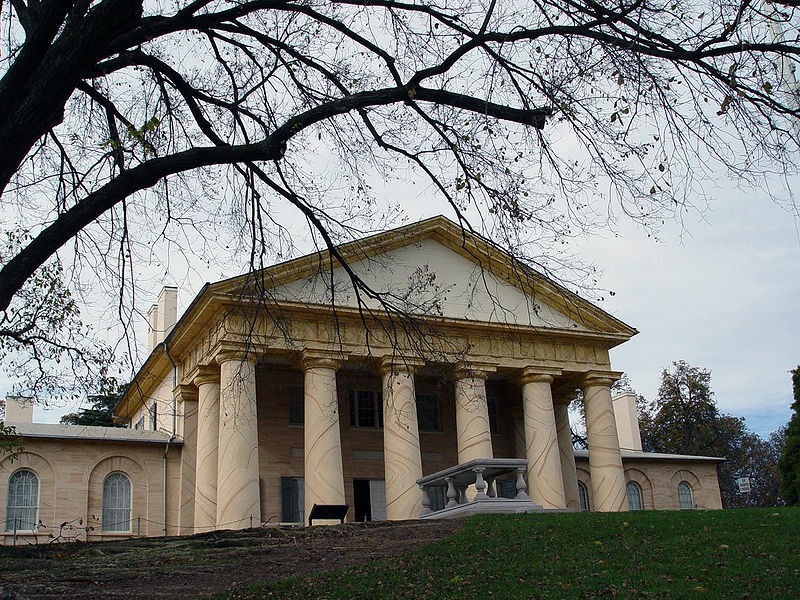 (About) Arlington House, The Robert E. Lee Memorial, also known as the Custis-Lee Mansion, is a Greek revival style mansion that once belonged to General Robert E. Lee, and it is surrounded by Arlington National Cemetery. Arlington House was built by slaves in 1803 with handmade brick covered with very hard cement referred to as “hydraulic cement,” and the surface was scored and painted to look like marble and sandstone, a faux finish. These faux finishes were very popular in the early 19th century, just as they are now. The back or West side of the house was left unfinished with the brick exposed until 1818. It overlooks the Potomac River, directly across from the National Mall in Washington, D.C. During the Civil War, the grounds of the mansion were selected as the site of Arlington National Cemetery, in part to ensure that Lee would never again be able to return to his home. However, the United States has since designated the mansion as a National Memorial to its former opponent, a mark of widespread respect for him in both the North and South. Today, the mansion is managed by the National Park Service as a memorial to Robert E. Lee while the land surrounding the mansion, known as Arlington National Cemetery, is managed by the Department of the Army. In 1900, Lee was one of the first 29 individuals selected for the Hall of Fame for Great Americans (the first Hall of Fame in the United States), designed by Stanford White, on the Bronx, New York, campus of New York University, now a part of Bronx Community College. The USS Robert E. Lee was a submarine named for Lee, built in 1958. Robert E. Lee remains an iconic figure of American military leadership. (Right) Photograph of the unveiling of the Equestrian Statue of Robert E. Lee, May 29, 1890. Richmond, Virginia. Library of Congress. This large equestrian statue of Lee, by French sculptor Jean Antonin Mercié, is the centerpiece of Richmond, Virginia's famous Monument Avenue, which boasts four other statues to famous Confederates. 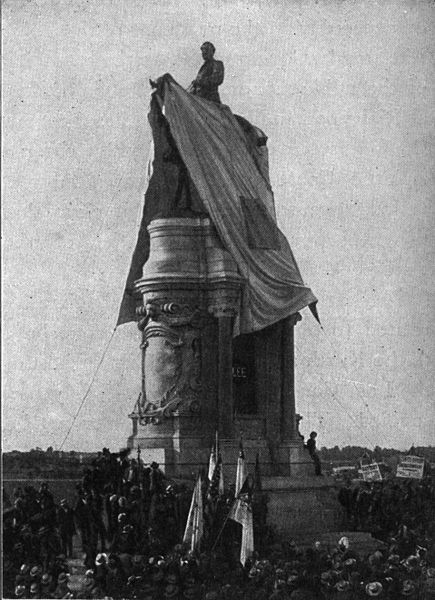 The monument to Lee was unveiled on May 29, 1890, and more than 100,000 people attended this dedication. Robert E. Lee had strong family ties to the South, and many of his relatives served in the Confederate Army: Major General George Washington Custis Lee (graduated first in West Point class of 1854), eldest son of Robert E. Lee and Mary Anne Custis Lee; General William Henry Fitzhugh "Rooney" Lee, second son of Robert and Mary Lee; Captain Robert Edward Lee, Jr., youngest son of Robert and Mary Lee, and the sixth of their seven children; General Fitzhugh Lee, nephew of Robert E. Lee; Brigadier General Edwin Gray Lee, second cousin of Robert E. Lee. In Freeman's elegant prose, Robert Edward Lee is nearly perfect in every respect - he is a modest, deeply religious man who dislikes slavery and secession but reluctantly agrees to side with his native state of Virginia when the Civil War begins. If the rest of Freeman's story sounds familiar it is because this book made it so. Lee, despite facing constant shortages of men and supplies, meets the overwhelming forces of the Northern States and defeats them in battle after battle. Yet after each defeat the Northerners simply recruit new soldiers, resupply their vast armies, and come after Lee's valiant but shrinking forces again and again. In the end not even Lee's tactical genius can save the outnumbered and outgunned Confederates from eventual (and in Freeman's opinion, inevitable) defeat. Naturally, some historians have not agreed with this view of the Old South's greatest icon, and later books on the "Gray Fox" have disputed Freeman's assertions that Lee was opposed to slavery and secession, or that his military decisions were always correct. 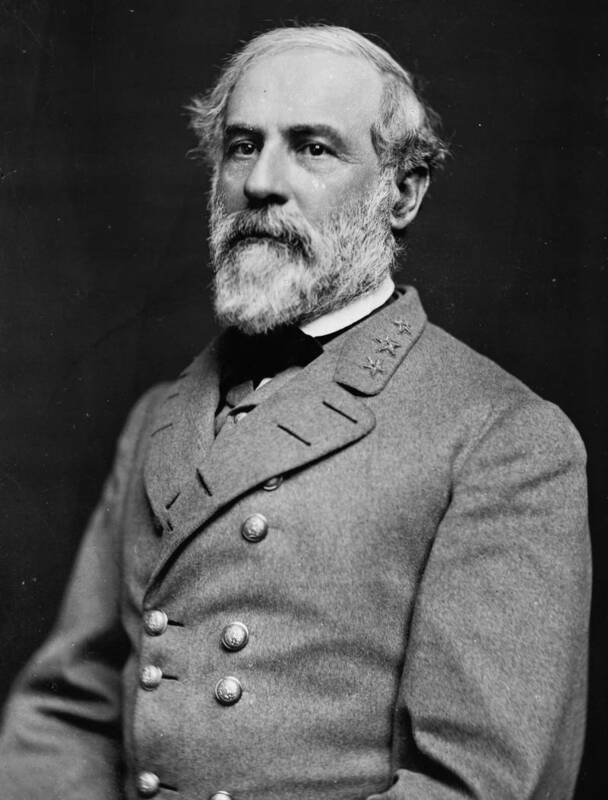 There have been numerous books written about Robert E Lee, but none have done so well at portraying his life or in explaining why, even today, Lee’s legend thrives and his tactics are studied at military academies throughout the world. A genuine "must-read" for any Civil War buff or student of military history. In this remarkable book, you'll learn the keys to Lee's greatness as a man and a leader. You'll find a general whose standards for personal excellence was second to none, whose leadership was founded on the highest moral principles, and whose character was made of steel. You'll see how he remade a rag-tag bunch of men into one of the most impressive fighting forces history has ever known. You'll also discover other sides of Lee—the businessman who inherited the debt-ridden Arlington plantation and streamlined its operations, the teacher who took a backwater college and made it into a prestigious university, and the motivator who inspired those he led to achieve more than they ever dreamed possible. Each chapter concludes with the extraordinary lessons learned, which can be applied not only to your professional life, but also to your private life as well. Today's business world requires leaders of uncommon excellence who can overcome the cold brutality of constant change. Robert E. Lee was such a leader. He triumphed over challenges people in business face every day. Guided by his magnificent example, so can you. Bibliography: Gettysburg National Military Park; Stratford Hall; Daughtry, Mary. Gray Cavalier: The Life and Wars of General W.H.F. “Rooney” Lee. Cambridge, Mass. : Da Capo Press, 2002; Official Records of the Union and Confederate Armies; Library of Congress; National Park Service; National Archives and Records Administration; Blassingame, John W. (July 1977), Slave Testimony: Two Centuries of Letters, Speeches, Interviews, and Autobiographies, Louisiana State University Press, ISBN 0807102733; Connelly, Thomas Lawrence (1977), The Marble Man: Robert E. Lee and His Image in American society, New York: Alfred A. Knopf, ISBN 0-394-47179-2; Davis, William C.; Pohanka, Brian C.; Troiani, Don (1997), Civil War Journal, The Leaders, Rutledge Hill Press, ISBN 0-517-22193-4; Eicher, John H.; Eicher, David J. (2001), Civil War High Commands, Stanford University Press, ISBN 0-8047-3641-3; Fellman, Michael (2000), The Making of Robert E. Lee, Random House, ISBN 0-679-45650-3; Freeman, Douglas S. (1934), R. E. Lee, A Biography, Charles Scribner's Sons; Fuller, J. F. C. (1957), Grant and Lee, A Study in Personality and Generalship, Indiana University Press, ISBN 0-253-13400-5; Hughes, Nathaniel C., Jr.; Liddell, St. John R. (1997), Liddell's Record, Louisiana State University Press, ISBN 978-0-8071-2218-1; Lee, Edmund Jennings (1983), Lee of Virginia 1642-1892, Genealogical Publishing Company, ISBN 0-8063-0604-1; Nolan, Alan T. (1991), Lee Considered: General Robert E. Lee and Civil War History, University of North Carolina Press, ISBN 0-8078-4587-6; Warner, Ezra J. (1959), Generals in Gray: Lives of the Confederate Commanders, Louisiana State University Press, ISBN 0-8071-0823-5; Blount, Roy, Jr. Robert E. Lee, Penguin Putnam, 2003; Carmichael, Peter S., ed. Audacity Personified: The Generalship of Robert E. Lee Louisiana State U. Pr., 2004; Connelly, Thomas L., "The Image and the General: Robert E. Lee in American Historiography." Civil War History 19 (March 1973): 50-64; Connelly, Thomas L., The Marble Man. 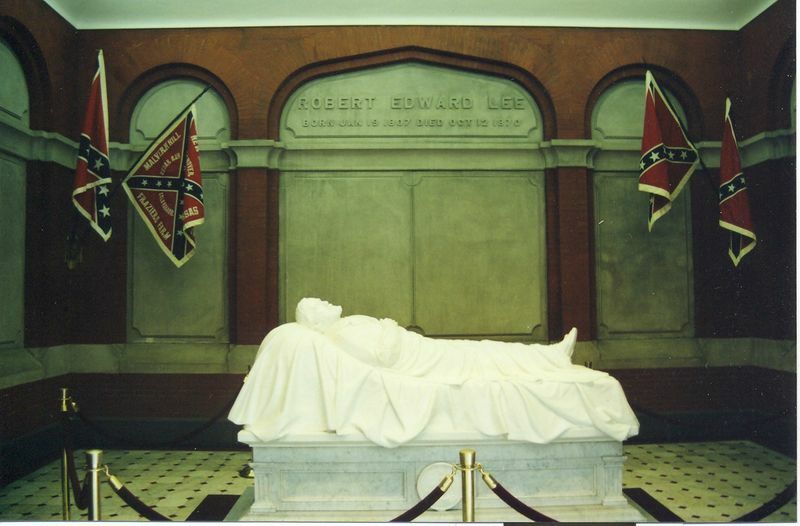 Robert E. Lee and His Image in American Society. New York: Alfred A. Knopf, 1977; Connelly, Thomas L., "Robert E. Lee and the Western Confederacy: A Criticism of Lee's Strategic Ability." Civil War History 15 (June 1969): 116-32; Cooke, John E., "A Life of General Robert E. Lee" Kessinger Publishing, 2004; Dowdey, Clifford. Lee 1965; Fellman, Michael (2000), The Making of Robert E. Lee. New York: Random House (ISBN 0-679-45650-3); Fishwick, Marshall W. Lee after the War 1963; Flood, Charles Bracelen. Lee — The Last Years 1981; Gary W. Gallagher; Lee the Soldier. University of Nebraska Press, 1996; Gary W. Gallagher; Lee & His Army in Confederate History. University of North Carolina Press, 2001; McCaslin, Richard B. Lee in the Shadow of Washington. Louisiana State University Press, 2001; Pryor, Elizabeth Brown; Reading the Man: A Portrait of Robert E. Lee Through His Private Letters. New York: Viking, 2007; Reid, Brian Holden. Robert E. Lee: Icon for a Nation, London: Weidenfeld & Nicolson, 2005; Thomas, Emory Robert E. Lee W.W. Norton & Co., 1995 (ISBN 0-393-03730-4) full-scale biography; Dowdey, Clifford. and Louis H. Manarin, eds. The Wartime Papers of R. E. Lee. Boston: Little, Brown, 1961; Freeman, Douglas Southall. ed. Unpublished Letters of General Robert E. Lee, C.S.A., to Jefferson Davis and the War Department of the Confederate States of America, 1862-65. Rev. ed., with foreword by Grady McWhiney. 1957; Missouri History Museum. Robert E. Lee Collection; Taylor, Walter H. Four Years with General Lee Reprint. 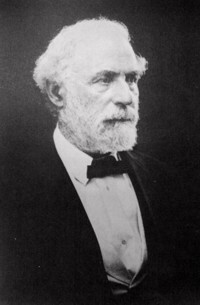 1962; Taylor, Walter H. General Lee — His Campaigns in Virginia, 1861-1865. Reprint. 1975; Peters, James Edward (1986). Arlington National Cemetery: Shrine to America's Heroes. Woodbine House. ISBN 1890627143; The National Parks: Index 2001-2003. Washington: U.S. Department of the Interior.